The National Art Museum will host exhibition of vintage posters on April 13-28. 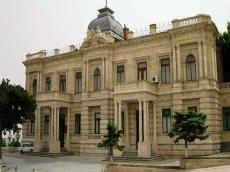 Co-organized by the Embassy of Switzerland and the Azerbaijan Ministry of Culture and Tourism, the event will be held as part of Francophonie Weeks in Baku. The exhibition "Go on vacation!" will feature posters created during the period 1971-2017, aimed at promoting the tourist potential of Switzerland. The exposition is timed to the 100th anniversary of Switzerland Tourism, a national marketing company dedicated to promoting Switzerland in the international arena as a country for tourism and business meetings. The first vintage posters appeared in the 1870s. When the French artist Jules Chéret opened the world a color lithograph, the graphics from around the world were able to express their marketing ideas in the form of stunning colorful posters. Jules Chéret mastered the art of lithography in the late 19th and early 20th century. Chéret’s posters became popular and required for ads by the music halls, cabarets, and theaters. He also designed different kinds of cosmetics, soaps, perfumes, and pharmaceutical products. Vintage poster is not just a picture. It's art work that reflects the modernity, the world, and attracts great public attention.